The 6 medal haul in 2012 and the expectations of a double digit winning notwithstanding, folks responsible for http://olympicmedalspredictions.com/countries.php have a very different take. According to them India is to get two medals only. The problem with forecasts is that the moment you start getting into specifics, you run the risk of being dismissed and not taken seriously. These folks should take a lesson from the story of Nostradamus (who, we now know was much more wrong than correct). Case in point: with all the dope around Narsingh Pancham Yadav, I am not sure of seeing him on the podium! According to the sports data analytics firm Gracedata (Infostrada sports), India is tipped to get a rank of 43 (which is definitely an improvement over our London performance). The key to a high rank is the number of golds, obviously. In London, we did not win any gold medals. Abhinav Bindra had shot India up to the 50th rank in Beijing – our best rank so far (in percentile terms) thanks to his gold medal. 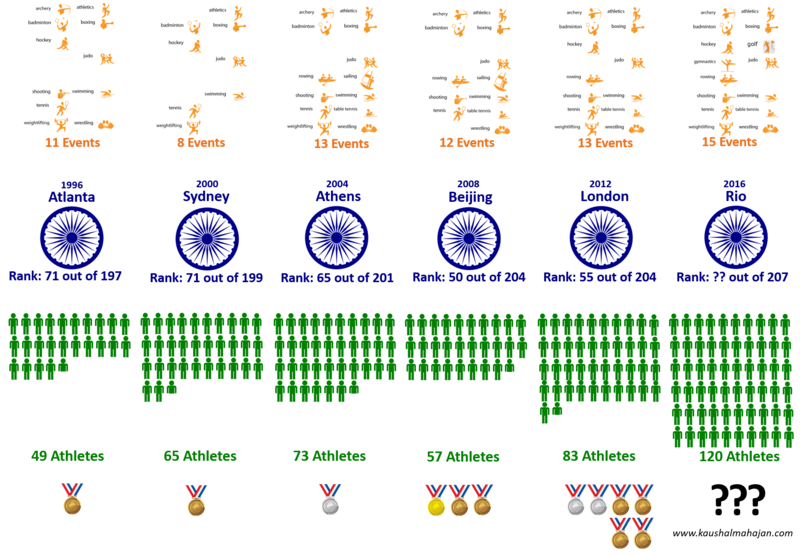 This incidentally is the ONLY individual gold medal that an Indian has won at the Games. Anyways, Gracedata’s number crunching for this year does predict that the Indian mens field hockey team will win the silver medal this year!! Which is awesome! The PwC model, this time around is much more optimistic about India. It indicates a final standing of 12 medals which is really a 100% improvement over the London performance. Well, if PwC’s prediction were to come true, then the NIFTY would be severely lagging behind at a 66% gain (over this period). BTW, here is an analysis of the accuracy of their 2012 predictions – surprisingly accurate. The chart on the right is an extract from the attached document. Many have said that it would be disappointing if India did not return with a double digit tally. Stranger things are known to have happened! Let’s see and pray.